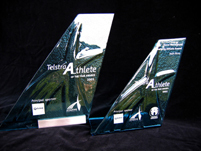 Shown here are three examples of glass Trophies that I have created for Athletics Australia. The first features several different coloured pieces of hand-made glass that are fused to form the client's logo. I have then etched the sponsors' and recipient details on the front face of the glass object. The blue glass Trophies have been impressed with the client logo into the rear face of the object. The larger Trophy is mounted on a stainless steel base while the smaller is self-supported by having bent the glass into an 'L'.